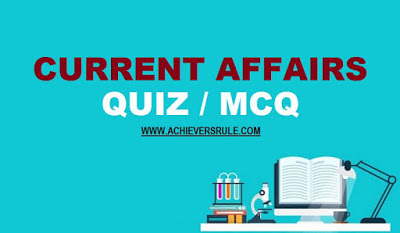 Solve the Daily Current Affairs Quiz - 24th and 25th December 2017 to judge your preparation for IBPS, SSC exams. The quiz set consists of recent updates regarding appointments, awards, agreements etc. Q1.25th December is celebrated in India as the "Good Governance Day" to honour the former Prime Minister of India ______ . Q2.Who would be the new Chief Minister of Himachal Pradesh ? Q3.National Farmers Day or Kisan Diwas is celebrated in the birth anniversary of _____ . Q4.The "SAMEEP" policy was launched by which ministry ? Q5.The "Ganga Gram" project was formally launched in _____ . Q6.Lt. General B. S Sahrawat has been appointed as the Director General of which of the following ? Q7.FACT has signed a MoU with which state Government to establish a Petrochemical Park ? Q8.Who is appointed as the next Ambassador of India to the Republic of Peru ? Q9.Who is appointed as the next Secretary General of Amnesty International ? Q10.Who is appointed as the new executive director of UNICEF ? Q11.Who is appointed the chairman of the University Grants Commission (UGC) ? Q12.Which Bollywood actor is appointed as English Premier League’s 1st brand ambassador in India ? Q13.Which of the following has been ranked as India's most trusted Fast Moving Consumer Goods (FMCG) Brand by the Brand Trust Report India Study 2017 ? Q14. "The Way I See It" is written by which of the following ? Q15.The seventh edition of the India International Coffee Festival (IICF) being organized by the India Coffee Trust and State-run Coffee Board to promote the Indian coffees globally will be held in _____ . Q16.India would set up IT center in Al Azhar University. The University is situated in which country ? Explanation 1. Good Governance Day is observed in India annually on the twenty-fifth day of December, the birth anniversary of former-Prime Minister Atal Bihari Vajpayee. Explanation 2. After its chief ministerial candidate Prem Kumar Dhumal lost in the Himachal Pradesh Assembly election that gave BJP almost a two-third majority, the party chose another Rajput leader and five-time MLA Jairam Thakur for the top post. Explanation 3. National Farmers’ Day (Kisan Diwas) 2017 was celebrated on 23rd of December National Farmers Day or Kisan Diwas is celebrated in the honor of Chaudhary Charan Singh who was the fifth Prime Minister of India. Explanation 5. Government has formally launched the 'Ganga Gram' project at the Ganga Gram Swachata Sammelan in New Delhi. As part of its clean Ganga mission - Namami Gange, the Ganga Gram project is an integrated approach for the holistic development of villages situated on the banks of the holy river with the active participation of villages. Explanation 6. Lieutenant General B S Sahrawat took over the reins of National Cadet Corps as its Director General. The General Officer is a third generation army officer. He is alumnus of the National Defence Academy, Khadakwasla and Indian Military Academy, Dehradun. Explanation 7. FACT has signed a MoU with Keral Government to establish a Petrochemical Park in Kochi. Explanation 8. M. Subbarayudu appointed as the next Ambassador of India to the Republic of Peru Shri M. Subbarayudu, (IFS: 1994), presently Joint Secretary in the Ministry of External Affairs has been appointed as the next Ambassador of India to the Republic of Peru. Explanation 9. South African human rights activist Kumi Naidoo has been appointed as the next Secretary General of Amnesty International. He will assume the charge in 2018. Explanation 10. UN chief Antonio Guterres has appointed former senior US government official Henrietta H Fore as the new executive director of UNICEF. She was the first woman to be appointed Administrator of the US Agency for International Development and Director of US Foreign Assistance in the Department of State, she held these positions between 2006 and 2009. From 1989 to 1993, she was working as the USAID Assistant Administrator for Asia and for Private Enterprise. Explanation 11. Professor Dhirendra Pal Singh was appointed the chairman of the University Grants Commission (UGC) He has been appointed the UGC chairman for a period of five years, according to the order issued by the Department of Personnel and Training (DoPT). Explanation 12. Ranveer Singh appointed English Premier League’s 1st brand ambassador in India The English Premier League has formed an official partnership with Indian film actor Ranveer Singh. The Bollywood star is a passionate football fan and will help promote the Premier League to fans in India and globally. Explanation 13. Patanjali has been ranked as India's most trusted Fast Moving Consumer Goods (FMCG) Brand by the Brand Trust Report India Study 2017 and has been announced as the most attractive brand in India. Explanation 14. The book, "The Way I See It" — a Gauri Lankesh Reader, has been edited by writer and sociologist Chandan Gowda and was launched at the Mumbai Press Club. Explanation 15. The seventh edition of the India International Coffee Festival (IICF) being organised by the India Coffee Trust and State-run Coffee Board to promote the Indian coffees globally will be held in Bengaluru from January 16-19. Explanation 16. India will establish a Centre of Excellence in Information Technology (CEIT) at Al Azhar University, Egypt's highest religious authority and one of the world's most eminent seats of Sunni Muslim learning.